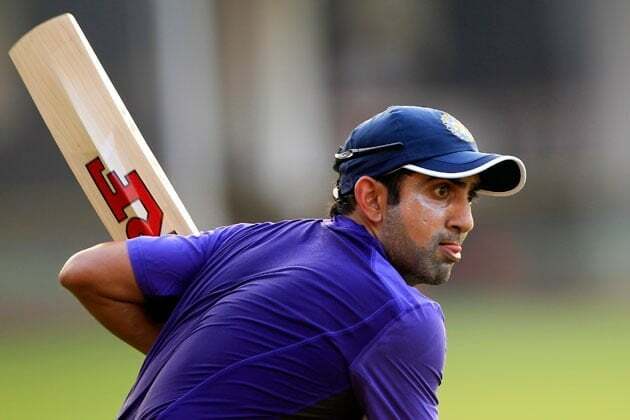 Gautam Gambhir celebrates his 35th birthday today. Cricmatez editor Jithu Jose Parackal takes a lookin on his 13 year love story with cricket. This day, 35 years ago the man who played twin world cup winning knocks was born in the suburbs of Delhi. Gautam Gambhir made his debut 13 years back as a shy 22 year old against Bangladesh in ODIs. He earned his first test cap in 2004 versus the mighty Aussies. Every cricketer, mostly batsmen would have a golden era or a purple patch. Gambhir had such sort of a period from 2008-2011 World Cup. In 2009, he was the ICC Test Player of the Year for his masterly performances in the longer format of the game. He was the No.1 Test Batsman in the ICC Rankings in 2008. Gambhir, along with his Delhi mate and partner Virender Sehwag gave much more stability and security in the Test scheme of things as regards opening the batting. One batsman went about murdering the bowlers and feeling them pity for having bowled at him, and the other(Gambhir) was there to play a balanced game and played the perfect ally for Virender Sehwag. Gautam Gambhir was also the captain of Kolkata Knight Riders, in which he led the team to two trophies. Gautam Gambhir was always a household name in the Delhi domestic circuit making a name for himself in the gentleman’s game. People who knew Gambhir would probably know that he was someone who should have made his mark in cricket much before than his partner Virender Sehwag. One would have to say his indecisiveness, a bit of unluck and some element of shyness didn’t allow him to achieve his full potential early on in his career. It was after the 2007 World Cup, Gambhir began to stamp his authority as a world class batsman. The withdrawal of star players like Ganguly, Sachin and Dravid from the inaugral WT20 tournament in South Africa prompted the team management to go with Gambhir and Sehwag as their primary openers. The tournament turned out to be very good for Gambir. Infact, he smashed 75 off 57 balls in the finals against Pakistan, helping India win the World Cup. It was the re-birth of Gautam Gambhir. He would go on to be the batting mainstay for the years to come. He carried forward his limited overs form into the Test format as well. He would join hands with partner in crime, Virender Sehwag and they were a formidable pair to reckon with. Gambhir was also the highest scorer the Test series against Australia, England and New Zealand. These were quality opposition and these performances by the champion batsman shows why he is special. In the longer format, he provided a lot of stability up the order. e had the temperament and the skillset required to excel in the top level. On the back of his excellent performances, he was made skipper in the home ODI series against New Zealand. The Indian team could make it a 5-0 whitewash at home, that was probably everyone knew Gautam Gambhir had more in him other than his exploits with the bat. I hope no one would forget the match winning knock he played in the 2011 World Cup finals against Sri Lanka at the Wankhede. In the finals against the Lankan Lions, Sehwag was the usual casualty and it needed someone at the top to hold the innings together. When the day came, Gautam Gambhir stood tall like a stallion with Virat Kohli to grind India out of danger. Kohli fell to a caught and bowled by the spin wizard Muralitharan, then came the captain. Even with the fall of wickets at the other end he remained calm and composed fighted for the team cause. After the 2011 triumph things began to take a toll on him, being under immense pressure to perform and ultimately dropping him from the team in 2012. But knowing the kind of man Gautam Gambhir was, everyone knew he wasn’t going to let it go. He came back in 2014 in the Test series in England only to be dropped from the team again. He has made a comeback again after 2 years in 2016. In the meanwhile, he won 2 IPL trophies in 2012 and 2014 editions as the captain of Kolkata Knight Riders. Gambhir is also known for his on-field spats with players like Shane Watson, Manoj Tiwary, Shahid Afridi and Virat Kohli. There was a feeling during a time when he was seen as someone who creates controversy out of nowhere. He lost a many of his fans during his spat with Royal Challengers Captain Virat Kohli during the IPL. But Gambhir being a man of grit and determination came back like a true king back to where he left two years agao, this time on the back of a fantabulous Duleep Trophy campaign leading his team India Blues. He scored a staggering 356 runs at 71.20, playing with the pink ball and leading India Blues to title. He was recalled into the team for the home series against New Zealand for the injured K.L. Rahul. Though he would have loved to play in Kolkata, he was not given the opportunity. But the opportunity came knocking in the test at Indore. It was indeed pleasure to see the gritty left hander making a comeback with an improved stance. He looks like he has learned from his past mistakes and he has had a serious thought about his failures. His comeback innings wasn’t so special, for he fell for 29. Gambhir flabbergasted everyone when he came u with a fighting 50 playing with injury. He wasn’t fluent like he should have been, but it was good to see him be amongst the runs again. There is hope in every cricket fan and in every Gautam Gambhir fan that he will be enthralling them again. With that single, Gautam Gambhir moves on to 35. Happy Birthday Gautam Gambhir!